Summer is at its peak in some countries in the Middle East during July-August. The mercury even soars to more than 45°C during the day. Information has it that the highest temperature recorded last year in Kuwait was 53.1°C on 15 June, 2010. People resort to various measures like using air-conditioners, reaching out for their sun glasses, sun screen lotions, umbrellas, hats and drinking lots of chilled drinks to get respite from the scorching heat. They even go to the extent of staying indoors during most of the day time and venture out only during nights 🙂 Last summer, I was quite new to the place and was in the process of getting acclimatized. Amidst juices, barley water, butter milk and other such usual stuff to beat the heat, I was introduced to a coolant prepared from a not so common ingredient called Gond Katira. Gond (Urdu: gum) Katira follows in the line of gum arabic, xanthum gum and guar gum and is used as an additive in the food industry. Known by a myriad of names like Goond, Katira or Quatira, Dragon gum, Tragacanth gum, Shiraz gum, gum Elect and Qujah, it is referred to as E413 on food labels. Katira serves as an emulsifier, thickener, binding agent and stabilizer. It is used in sauces, salad dressings, processed cheese, cottage cheese, ice cream, icing and confectionery. On acquiring this information, I frantically searched the labels of some of these foods at home, but was disappointed on not spotting E413 on any 😦 Then it dawned on me that since Katira is native to Middle Eastern countries like Iran, Iraq, Syria and Turkey, I should rather be looking for it on products manufactured from such places. Katira is the exudate obtained from the roots and incisions made in the stem of various species of leguminous shrubs belonging to the genus Astragalus (locoweed or milk vetch). Though the gum is extracted from A.adscendens, A.tragacanthus and A.gummifer, the one from the latter (common name: goat’s thorn) is rated to be of the best quality. The gum is tasteless, odourless, predominantly dull white with tinges of brown and amber. It is viscous and dries into flakes, blocks or crystals on exposure to air. It is composed of polysaccharides and like any other gum has no nutritional value. Its virtue of swelling on absorption of water paved way for its use as a texturant in food industry; this trait also makes it a good laxative. Katira packets are usually placed along with the spices and condiments in super markets and cost 600 fils per 100 g.
Gum Karaya or Indian Tragacanth is often mistaken for Katira. Though Karaya has properties similar to that of Katira, it is the sap obtained from the bark of a tree called Sterculia urens (local name: Thapsi or Karaya tree) and its industrial identity is E416. Karaya is sometimes used to adulterate Katira. Pound the Katira blocks to get smaller crystals. Do not powder them finely as it may make it difficult to separate the impurities. Soak the crystals in water overnight so that they absorb water and swell. The swelled up gel is not gooey but sort of stiff. It looks like crushed ice, to be precise. Tip: Do not be misled by the small quantity of gum taken for preparation because it expands to enormous volume. About 25 g of gum in 300 ml of water filled a 500 ml capacity bowl up to the brim on gelling. So, use a relatively large bowl to soak the gum. Next day, drain the water away; wash the gel twice or thrice; remove the impurities. Boil milk; add sugar and cardamom to it; simmer it and reduce it to half its volume; refrigerate it. Add the chilled flavoured milk to about 2-3 tbsp of gel. Wow! This gummy coolant is not a mere visual treat, it tastes yummy as well. The traditional preparation is a simple mixture of the swelled up gel with cold milk and sugar. But just to pep it up a little, I added the thickened milk, flavouring and nuts. We could tap our imagination to extend Katira’s use in sherbets, cordials, custards and many other desserts. Posted in Beverages, Edible Gums and tagged Coolant, E413, E416, Gond Katira, Gum Karaya, Indian Tragacanth, Tragacanth gum. Bookmark the permalink. 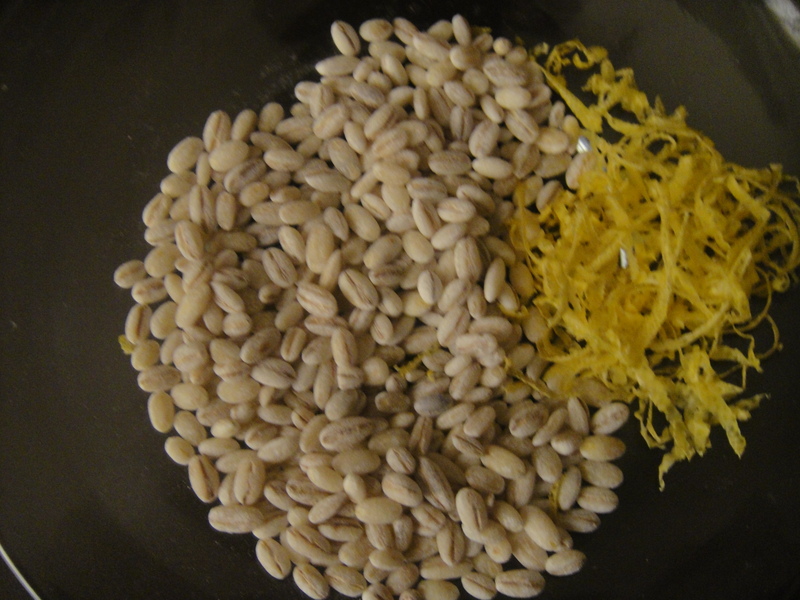 Rinse pearl barley to remove any dirt or debris in it. Boil barley in water and then simmer it for 10-15 min. 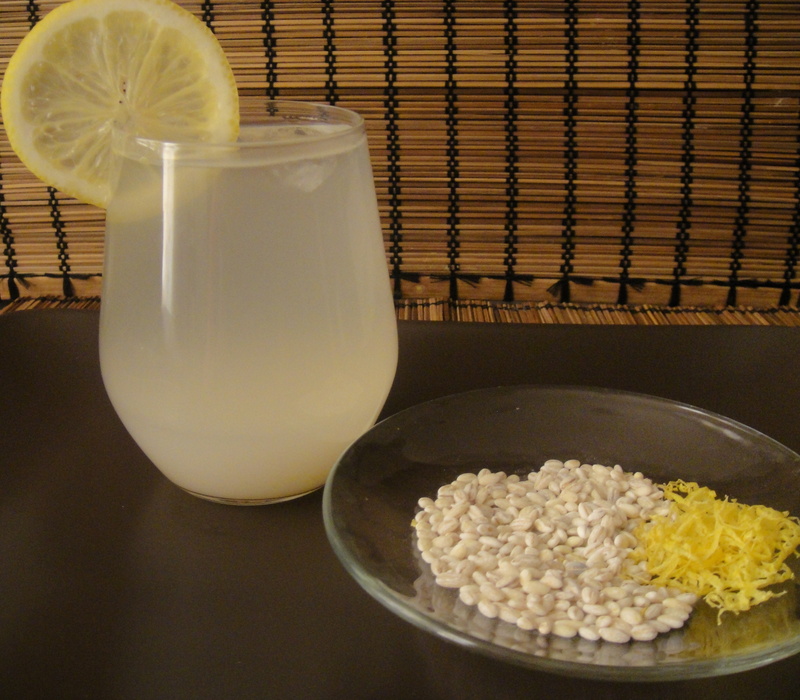 Strain clear barley water into cups containing sugar and lemon zest. Allow it to cool down and add a few ice cubes to it. Add lemon juice for flavor and stir it well. And yes your nutritious coolant is ready. Orange juice or mint can be used to flavour it. Sometimes I also add a small quantity of milk to barley water. If you do not want it sweet, just spice it up with a pinch of cumin powder and salt… and when it comes to combinations sky is the limit. Learning about some of the benefits of this drink may prod you to include it in your routine menu. It rehydrates the body and is an excellent thirst quencher. Pearl barley is loaded with copper, calcium, iron, manganese, magnesium, selenium, phosphorus, potassium and sodium. The presence of potassium and the fact that it leaches into water has been exploited in using barley water for restoring fluid and electrolyte balance of the body. It acts as a diuretic and comes handy when you want to relieve yourself of oedema i.e., swelling caused due to retention of water in the body. It helps in preventing urinary tract infections and soothes inflammations in the tract. The soluble fiber in barley called beta-glucan softens stools by its capacity to absorb water and hence eases bowel movements. Beta-glucan binds to bile acid and flushes it out along with the cholesterol contained in it, thereby reducing blood cholesterol level in the body. Beta-glucan also delays absorption of carbohydrates thus reducing Diabetics’ need for insulin. It can be given for convalescing patients and just plain barley water can also be used as weaning food. Well, if barley water’s long association with Wimbledon will help to elevate its image, then it is worth mentioning that it has been served to the players off and on the court since 1935!!! And for those who want to maintain the reputation of a teetotaler and still have a taste of barley, this drink might be an ideal option. I usually reuse the same barley three or four times before discarding it. Posted in Beverages and tagged Barley water, Beta glucan, Coolant, diuretic, lemon barley, Thirst quencher, weaning food. Bookmark the permalink.